We have a new set of tools for image processing in the Simutrans community, that complements the Shades tool. 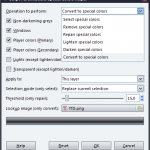 It’s recomended for those who work with special colors directly within the XCF file (gimp native image format). It offers several functions like selecting, removing, repairing, lightening, darkening and converting special colors. 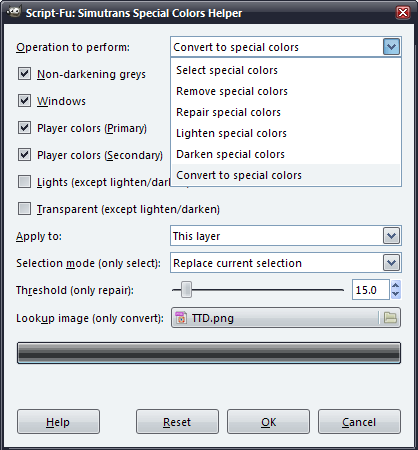 It works with six different groups of special colors, the basic in Simutrans: Non-darkening greys, Windows, Primary player colors, Secondary player colors, Lights and Transparency. Surely many of you have dreamed with creating a new pakset for Simutrans, but you don’t know the requirements, specially what do you need to create the less common part of paksets: the graphics. To know more about this process, we are going to talk with James “The Hood“, the pak128.Britain manager and graphics creator.